Because I’m a horrible son, I’m going to be out of town this Sunday. Lucky for me, my Mom still manages, somehow, to love me. 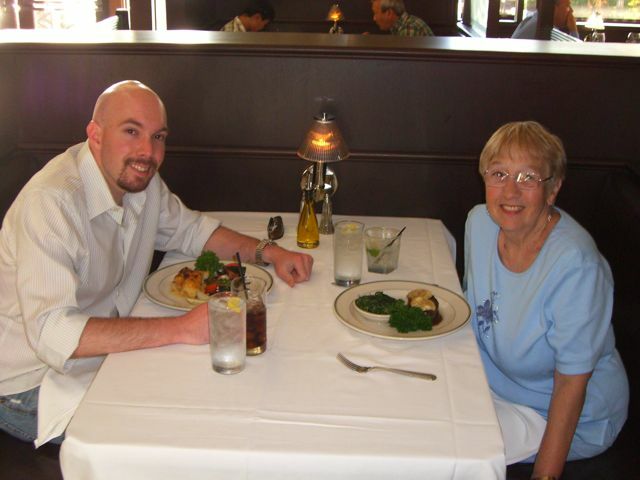 In fact, she let me take her out for a pre-mother’s day dinner in order to make up for being such a jerk. 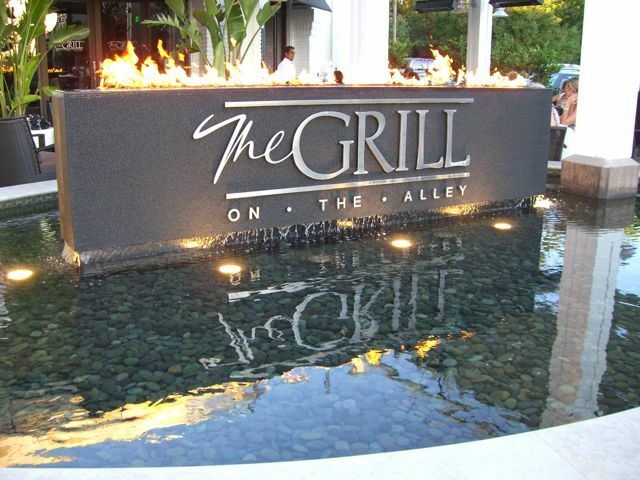 I decided that I’d better make it a good one, so I decided to go to Westlake’s answer to Mastro’s in Thousand Oaks: The Grill on the Alley. First off, this place is pretty easy on the eyes. I love the dark wood and dark leather booths contrasting with the blinding white paint on the walls. This place is going for the old school steakhouse vibe, with starched white tablecloths and gleaming cutlery. It was exactly what I was hoping for. Unfortunately, the look of a restaurant is only part of the charm. If it were the whole thing, Dakota’s would still be in business. We had an early dinner reservation, arrived on time and were sat immediately. From our table, I got a pretty good view of the rest of the place. They have a private dining area that I wanted to peak my head into, but I never got the chance. I didn’t see anyone else go in either, so maybe the market for private dining in Westlake isn’t so hot these days. Anyway, I lost track of the time while telling my mom how awesome she is and by the time I looked up our waiter had arrived. As you probably have learned by now, service is a huge deal for me. Bad service can make a good meal taste horrible and great service can take average food and infuse it with more addictive properties than heroin. Our waiter was very good when he was at the table, but it looked like they gave him about five too many tables so we only saw him infrequently. When he did stop by, he committed the cardinal sin of trying to make up for his absence by talking, a lot. I can talk with the best of them, but when you can’t get a word in with your waiter, there’s something wrong about that. We started off with an appetizer, the crab cake. I tried to talk my Mom into the seared ahi, but she didn’t bite. The crab cake was very nice though. It was jumbo lump crab instead of the crab puree you’re served at lesser establishments. It was served with a beurre blanc sauce, which was a little on the thin side, but delicious nonetheless. Beurre blanc is essentially a reduction of butter and white wine. There are other ingredients that you can add, but those two form the base. 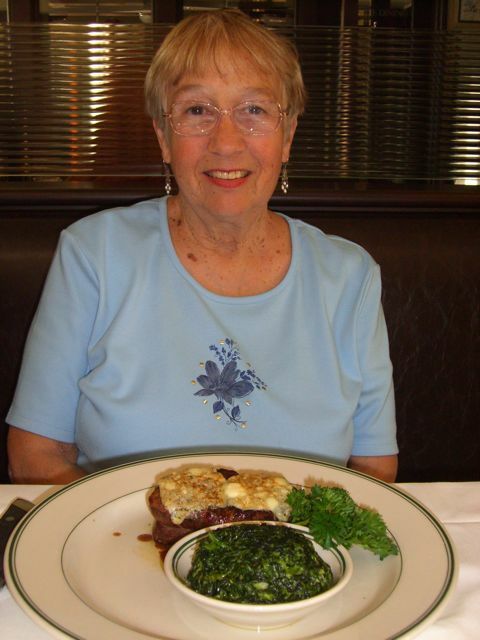 For our main courses, I had the sea bass with mustard cream sauce and my Mom had the filet mignon with bleu cheese crust. When my bass came out, I was shocked at the size of the filet. It had to be at least 10-12 ounces. Usually I get a portion about 1/2 the size and am fairly content. Since the fish was so big, I was concerned that they wouldn’t be able to cook it evenly. This was only the case in the extreme center and even then it was pretty decent. The sauce was nothing to write home about though, as it was even thinner than the beurre blanc. 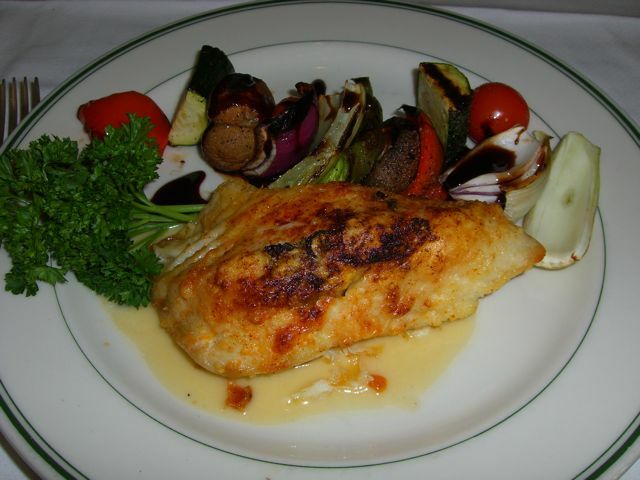 They paired the fish with grilled vegetables: tomato, mushroom, squash, red onion and white onion. I’m not a huge fan of eating big chunks of onion, but the rest of the veggies were not bad. They drizzled a balsamic glaze over them which gave them a sweetness that blended with the char from the grill. My mom ordered her steak medium, but when she cut into it I barely saw any pink at all. Then she tasted it and all was forgiven. I was skeptical, so she offered me a bite. It was probably the most tender filet mignon I’ve ever had in my life. I don’t even order filet anymore because when you get it, it’s either too tough from being burned to death or so raw you have trouble cutting it. I don’t know whether it was the quality of the beef or the chef, but this steak was impressive. For the bleu cheese crust, they used a mild flavored bleu and they put enough on the steak to justify including it on the menu. Most places get cheap bleu cheese, throw a few crumbles on top and burn it under the broiler. This was a much better effort. They served a creamed spinach with the steak, which my Mom thought was decent, but not decent enough to eat more than half of it. Though, that might be because she filled up on all that awesome steak first. Mom, you totally look late 40s, tops. After the very rich, very filling meal, my Mom decided to take a rain check on dessert. All the better for you lucky readers because I’ll be able to get another post out of the deal. If you have any ideas on where we need to go, leave them in the comments. Overall, I had a very good experience at The Grill. I’m not going to sugarcoat it, this place can get expensive. Our two main courses, one cocktail and the appetizer came to about $115. This isn’t the place you go every night. It’s the place you take the most important lady in your life (like I did). Take it for what it is, a decadent dining experience, meant to be enjoyed and remembered. Mikey and I are off to San Francisco tomorrow, so hopefully we’ll have some good food to report on next week. We’ll have a post tomorrow, but on Sunday all bets are off as Mikey will be driving me home in his new whip. I’ll be sure to take some pictures. Have a good weekend and a happy Mom’s day!